Schlock-Wire: Full Specs For Scream Factory’s I, MADMAN Blu-Ray Special Edition – Schlockmania! Scream Factory is taking another dive into deep cult horror flick territory in July when they issue a special edition blu-ray for I, Madman. This forgotten genre outing from 1989 reteams the same director and FX wizard behind The Gate and stars ’80s cult starlet Jenny Wright. The disc will include a variety of supplements created especially for this disc. Read on for all the frightening fiction-gets-real details, including a list of the extras and a pre-order link. Pre-order This Must-Have Blu-ray Today! After a spine-tingling paperback catches the imagination of bookstore clerk Virginia, she seeks out the author’s second book, I, Madman. But once she opens the cover, its eerie tale of obsessive love comes to life, catapulting a disfigured, scalpel-wielding killer from the world of fiction onto the streets of Hollywood with one demented goal: to win Virginia’s love, one murder at a time! Directed cult filmmaker Tibor Takacs (The Gate), I, MADMAN stars Jenny Wright (Near Dark, The Lawnmower Man), Clayton Rohner (April Fool’s Day, The Human Centipede III) and three-time Academy Award® winner Randall William Cook (Dr. Caligari) as the mysterious and frightening Malcolm Brand. On July 21, 2015, SCREAM FACTORY™ is proud to present I, MADMAN Blu-ray™ on home entertainment shelves for the first time. Arriving for the first time on Blu-ray, this long-awaited release contains insightful bonus content, including interviews with director Tibor Takacs, actor & artistic supervisor Randall William Cook, screenwriter David Chaskin, actor Clayton Rohner and actress Stephanie Hodge, behind-the-scene footage, audio commentary and much more! 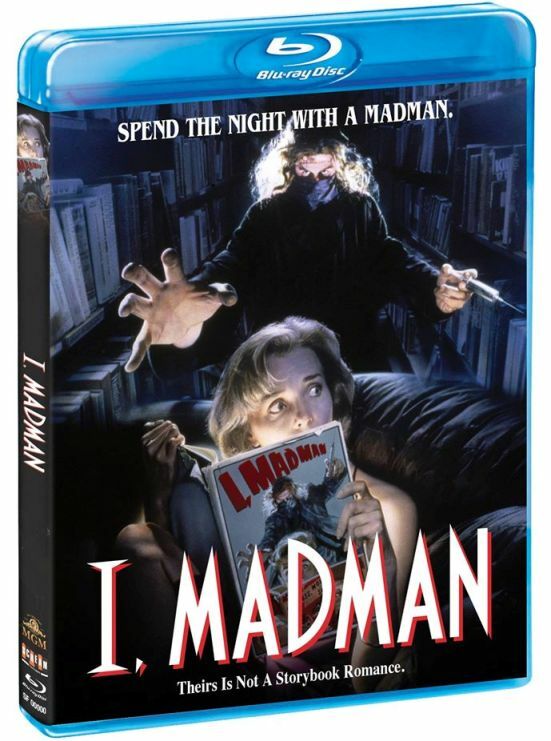 A must-have for movie collectors and horror enthusiasts, I, MADMAN Blu-ray is priced to own at $24.97 SRP. Ripped From The Pages – The Making of “I, Madman”, featuring interviews with Director Tibor Takacs, Actor & Artistic Supervisor Randall William Cook, Screenwriter David Chaskin, Actor Clayton Rohner and Actress Stephanie Hodge.